Hurricane Fly once again got the better of old foe Jezki in a pulsating renewal of the Ryanair Hurdle at Leopardstown. With the score three-two in favour of Willie Mullins' brilliant hurdler heading into their latest battle, Hurricane Fly was the 5-6 favourite to get the job done again. Jezki was the first of the big two to commit for home in the hands of Tony McCoy, but Ruby Walsh tracked him through aboard Hurricane Fly and there was little to choose between the pair jumping the final flight. Both horses fought tooth and nail to the line, but it was Hurricane Fly who brought the house down with another determined success. The winner's stable companion, Arctic Fire, was not far behind the big two in third. Walsh said: "He's an incredible little horse, but it takes two horses to make a race and, in fairness to Jezki, he showed up today and it was an honest race. "Plinth and Alderwood built the pace all the way down the back (straight) and it turned into a test of stamina more so than a sprint. "He's a pleasure to ride. To have him at the peak of his powers for so many years is an incredible feat. "You'll never take 21 Grade Ones away from him and counting." Mullins said: "I think he's the best anyone has ever trained over jumps. "I'll never have another horse like him. Mullins was keen to praise Hurricane Fly's fighting qualities which yielded a half-length success. "There is a fantastic atmosphere here and it was a fantastic race just to watch," said the County Carlow handler. "It was a superbly run race. JP's horses had the advantage, tactically. I told Ruby to ride him as you find him and don't try and beat Jezki. "Coming to the final flight, Fly always gets a good jump but Jezki got a fantastic one as well. "When he got over the last he put his ears back and no horse I've ever seen can battle like him. "When he got his head in front he kept it there and he's just a professional. "Ruby said he jumped a shadow at the first and landed on it. He had a bit of gorse stuck in his girth coming back in which must have been uncomfortable for him. "He didn't look happy going away on the bend from the stands and it took him until about the mile to warm up. "We expected Jezki to be better but we knew we were better as well. There is not much between them. "We're always trying to find the next one coming along but I don't think I have anything like him. "Faugheen is seven from seven but he has a long way to go. Hopefully we find another one but he's unique. "Last year people were asking me would he be retired but I said, 'No, why?'. "He had two less-than-good runs but any horse is allowed that. I thought if the ability was still there there was no question and he was showing at home that the zest for racing was still there. "We probably didn't do enough with him in the second half of last season. "We were training him like he was when he was still keen but he's not like that now. We rectified that now. "I'm enjoying his wins more now as there is not the pressure there used to be." 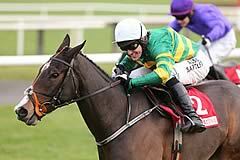 Trainer Jessica Harrington said of Jezki: "He lost nothing in defeat. "He settled great for AP (McCoy) and he jumped brilliantly - there are no excuses. "Hurricane Fly is just very, very hard to beat around here. "Jezki was definitely more relaxed. He jumped well and dead straight and, from that point of view, everything went great. 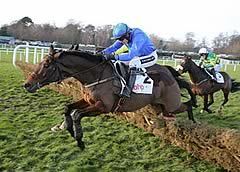 "They went at it hammer and tongs from when the time they turned in and they both jumped the last well, Hurricane Fly was just marginally quicker away from it than Jezki. "He seemed to be fine after the race so, all being well, we'll head on to Cheltenham and hope the hill will make a little bit of a difference."